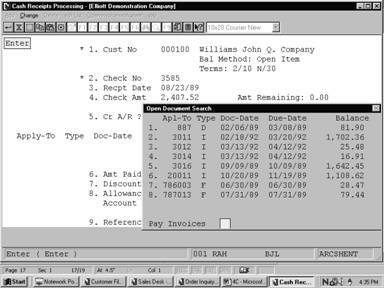 Cash Receipts Processing is an application that you will use quite often. You will use it whenever you have received payments from any of your customers and want to apply those payments to the customer's account. A few important concepts that you should understand will be covered here, before the explanation of Cash Receipts Processing, even though some of them have been covered before. When we speak of an Open Item here, we mean a transaction on the customer's account that has not been fully settled yet. For example, the customer made a purchase from you in the sum of $500, but he has not yet paid you for it. The record of this transaction is called an open item. All of these transactions are stored in a file called the A/R Open Item File. When a customer uses the Balance Forward method of accounting, he does not pay off individual open items every time he sends you a payment. The money that he sends you just goes onto his account, and pays off the earliest open items outstanding. The way banks handle credit cards is very much like this. When you send them a payment, it does not pay off the particular open item generated as the result of some purchases you have previously made. The payment just goes onto your account, and reduces the amount that you owe the bank. In Open Item accounting, on the other hand, when the customer sends you a payment, he usually indicates which open items he is paying. Some customers will insist that their account be handled on an Open item basis, since they anticipate the possibility of disputes on certain items, and they do not want any of their payments to apply to those disputed items. When you receive a payment from a customer, the accounting method that you have specified for him will determine how you enter the Cash Receipts transaction. If the customer is a Balance Forward customer, all you have to enter is the date of the check, its check number and its amount. If the customer is an Open Item customer, on the other hand, you have to enter additionally which open items to apply the payment to. How­ever, if you elect to do so, you can have the program automatically apply the payment to the oldest open items on the customer's account. When the term A/R Cash is used here it refers to cash that is being applied to a customer's account. The account of this cash will reduce the total amount your customer owes you. Since this amount is applied toward the total amount owed you by the customer, in other words it applies toward the total amount of your Accounts Receivable; this pay­ment is called A/R Cash. Occasionally, you will receive a payment that does not affect the total of your Accounts Receivable, and is not applied to a customer's account to reduce the amount he owes you. For example, if you were to sell some used desks or other office equipment and if you received a cash payment for them, the amount of this cash is not A/R cash. It does not apply to the account of one of your customers to pay off open items for which he owes you payment. But you would still want to record the fact that the cash had been received. As was said above, if a customer uses Open Item accounting, when he sends in payment on his account, he usually designates which open items he is paying with the check. In other words, he applies cash to particular open items. The way the programs keep track of this is by storing in the payment transaction the invoice number of the sale transaction that is being paid. The invoice number that is stored in the payment transaction is called its apply‑to number. When you are applying cash to the account of an Open Item customer, the program will ask you to enter the apply‑to number of the payment. In other words, enter the invoice number of the sale transaction that you want to apply the cash to. Open Credit is some amount of cash that you put on an Open Item cus­tomer's account that is not applied to any specific open items. For example, if a customer sent you a payment that was too large, and there was still cash left over after paying off all of his outstanding open items, you would place the remainder of the payment on the customer's account as Open Credit. This Open Credit could later be applied to open items when the customer makes future purchases. The way you enter Open Credit on account is to enter a zero apply‑to number, or just press RETURN for the Apply‑To Number Entry field, when you are applying the cash to the customer's open items. The program will then display ***Open Credit On Account*** and allow you to enter the amount to put on account as Open Credit. Enter a new Cash Receipts transaction for the customer, using the same check number as the original check received from the customer and today's date. Enter the amount of the check as zero. Then proceed to apply this check to the customer's account. First of all, bring up the amount of open credit on the customer's account by entering zero for the apply‑to number. For example, let us say that the customer has $1,000 on account of Open Credit that you now want to apply to pur­chases that he has made. When you enter zero for the apply‑to number, the program will show you that the customer has $1,000 of Open Credit. For the Amt. Paid field, enter ‑1,000 dollars. This will cancel out the Open Credit, and display that you now have $1,000 to apply to other items. Then just proceed to apply this $1,000 in the usual way. Quite frequently, when a customer sends in payment on his account, he also claims some sort of a discount on those items. You, of course, have to determine whether that discount is valid or not, and whether you are going to allow it. Usually this decision is fairly straight­forward: did the customer send in payment early enough to qualify for the discount? When you apply cash to an Open Item customer's account, as you bring up each unpaid open item for payment, the program will calculate and display the amount of any valid discount. This valid discount is calculated based on how many days the customer has to make payment before he loses the discount, and what the percent of discount is that he is entitled to. This calculation is for your information. You can enter any amount of discount that you want to give the cus­tomer, or no discount at all. You are not constrained to enter the calculated amount. Occasionally, you may want to give the customer some additional credit on his account other than the amount of the payment or a discount. For example, upon receipt of the goods ordered, the customer finds that their quality is not as high as he expected, but instead of returning the shipment, he says he'll take them as they are if you'll negotiate a slightly lower price with him. So you agree to take a certain amount off the amount of the original invoice, at the time that you are entering the payment for it. This additional amount of credit is called an allowance. Whether the customer uses Balance Forward or Open Item accounting, you will be given the opportunity to enter, along with each Cash trans­action, the amount of any discount and any allowance that you want to give the customer. It is not uncommon for a business to have more than one bank account in which it deposits the cash it receives. If you specified in A/R Setup that you have more than one Cash account, the program will ask you, when you begin to add new Cash Receipts transactions, in which Cash account you are going to deposit these receipts. Enter the G/L account number of the account, and then enter all of the Cash transactions that are to be processed for that Cash account. You can then end off on the processing for that Cash account and go on to enter the transactions for the next Cash account. It can be very helpful to you to have at hand a list of all the open items on a customer's account and how much he owes on them before you actually begin entering Cash Receipts. There is a report called the Open Invoice Worksheet that will allow you to print, for whichever customers you choose, a list of the open items for each customer, how much is currently on each open item, and the amount of discount still valid on the item. Beside each item, a space is left for you to enter how much cash you want to apply to that item. The data entry of the transactions can be very rapid once you sit down with this report at hand. We support two types of CSV formats for Cash Receipt Import: Detail and Summary. (1) Lock Box: The customer payments are sent to a lock box and your bank will perform a cash receipt on your behalf and send you the data in electronic format. (2) High Volume Customer: A high volume customer, like Wal-Mart, may pay a thousand invoices with one check and the check and invoice information is available in a spreadsheet. Self Scanning Checks and Clearing: Many banks have begun providing high volume, premium customers with an in-house scanner and OCR software for scanning checks. The checks clear much faster than the conventional way of depositing checks into the bank. 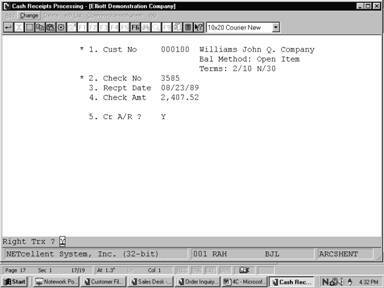 The scanning OCR system can usually provide CSV data to speed up the Elliott Cash Receipt Import. Since the summary CSV file does not contain all necessary information for a cash receipt, the import is to speed up the cash receipt data entry, not to totally automate it. The user will still need to perform the cash application. 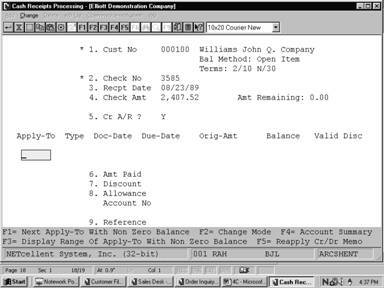 As part of the Cash Receipt Import improvement, Elliott V7.4 now supports batch ID and cash receipt transactions can be printed and posted by batch ID. Enter the number of the customer whose payment you are processing. The customer's balance method and terms will then be displayed. Enter the number of the customer's check. Enter the date you received the check. This is the date that will be used in calculating whether the cus­tomer's payment was made in time for him to receive a valid dis­count. In some cases, you may want to enter the date printed on the customer's check, or the date of the postmark on the letter. The choice of which date you enter here is up to you, and is governed by your own internal policy on discounts. Enter the actual amount of the check, not counting any discount or allowance you plan to give the customer. Enter whether the payment is to be credited to A/R or to some other account. If you are unsure what this means, refer to the section of the Application Overview for Cash Receipts Processing titled, A/R Cash vs Non‑A/R Cash. Enter the number of the account in which this Cash Receipt is to be recorded instead of the A/R account. Pressing the F7 key will allow you to search for the account by number. Pressing the F8 key will allow you to search for the account by description. You can enter anything here in this reference field that you choose. For example, you might want to enter some brief descrip­tion of the transaction or some comments about it for your future reference. 8 numeric digits with 2 decimal places and an optional minus sign (999,999.99‑). Enter the amount of any discount that you are giving the customer along with his payment. Enter the amount of any additional allowance that you are giving the customer along with his payment. If you enter an allowance amount, you must also enter the account number in which the amount of the allowance is to be recorded. Enter the number of the account in which the amount of the allowance is to be recorded. The descrip­tion of the account will be displayed next to the account number. Enter a brief description. If you pressed the F1 key above at apply-to number, the customer number and check number will be displayed. Do You Wish To Automatically Apply This Check? If you answer Y to the auto­matically apply this check question, the program will attempt to fully pay the lowest apply‑to number with a non‑zero balance for this customer. The program will fully pay as many non‑zero apply‑to numbers as possible. If the check amount is greater than the remaining balance of non‑zero apply‑to numbers, then the program will place the balance of the check as an open credit on account for this customer. There are several possible types of entries that you can make for the apply‑to number. You can enter the six‑digit number of the invoice to which you wish to apply some portion of the customer's payment. The program will then look in the customer's account to find out how much the customer still owes on that invoice and whether he has any discount still valid on it. All of this basic information about the invoice will then be displayed, and you can enter the amount that you want to apply to the invoice. You can press the F1 key. If you press F1, the program will look in the customer's account for the next lowest apply to number that has not been fully paid (next after the one you were last look­ing at, or the first one in the customer's account if you have not looked at any yet). All of the same basic information about the invoice that was mentioned above will be displayed for your infor­mation, and if you want to apply part of the check to this invoice, you will be allowed to. When you reach the end of the open items for the customer, that is, you have looked at all of the unpaid transactions on the customer's account, the program will let you know that this has happened. Then if you press F1 again, the program will start over again, with the first of the customer's transac­tions that is still unpaid, if there are any. You can press the F3 key. If you press F3, the program will display a range of invoices starting with the lowest apply to number that has not been fully paid. The pro­gram will then prompt you to enter the range of apply to numbers you wish to apply the check to. The program will then automatically calculate the amount to be paid and any discount to be taken. The program will attempt to pay off the balance owed on the documents selected completely if there is sufficient cash remaining to do so. If the amount remaining to be applied plus the valid discount allowable add up to at least the current balance owed on the docu­ment, the program will take the discounts and pay off the balances. If the amount remaining plus any valid discount is less than the balance of the open items, the entire amount remaining will be applied to the last open item, but since the balance cannot be paid entirely, no discount will be taken for that open item. You can enter zero for the apply‑to number, or just press RETURN. When you enter a zero apply‑to number, this means that you want to either apply cash to a Balance Forward record that exists in the customer's account, or you just want to put some amount of the check on the customer's account as an unapplied Open Credit. If a Balance Forward record exists in the customer's account, its balance will be displayed in the same way that invoices are dis­played. If you are placing the cash on account as Open Credit, the program will display, ***Open Credit On Account***, and allow you to enter the amount of the check to apply as Open Credit. When you have fully applied the check amount to the open items on the customer's account, press the ESC key, and the program will return to the Customer No field above in preparation for the entry of another Cash Receipts trans­action. The program will not let you end off on the application of cash until the entire amount of the check has been applied to the customer's account. Enter the amount of the check that you want to apply to this trans­action, not counting any discount or allowance that you plan to give the customer. If you wish, you may press the F1 key for the Amt Paid field, and the program will automatically calculate the amount to be paid and any discount to be taken. The program will attempt to pay off the balance owing on the document completely if there is sufficient cash remaining to do so. If the amount remaining to be applied plus the valid discount allowable add up to at least the current balance owing on the document, the program will take the discount and pay off the balance. If the amount remaining plus any valid discount is less than the balance on the open item, the entire amount remaining will be applied to the open item, but since the balance cannot be paid entirely, no discount will be taken. Enter the amount of discount that you are giving the customer along with his payment. Enter the amount of any additional allowance you are giving the cus­tomer. Enter the number of the account to which the allowance amount is to be posted or press RETURN to default to the allowance account in A/R Setup. You must enter a valid account number here if you entered an allowance amount. If you did not enter any allowance amount, this entry field will be skipped. Pressing the F7 key will allow you to search for an account by number or pressing the F8 key will allow you to search for the account by description. Enter whatever brief reference you want to place here. If you pressed the F1 key for the Amt Paid field above, the program will fill in a brief default descrip­tion of the transaction. Enter the number or numbers of the customers for whom cash has been received and for whom you wish a worksheet of open items detailing item balances and valid discounts. If you press RETURN for the first entry of a customer number, the program will default the field to All customers, and the worksheet will detail the state of the accounts of all of your customers. Enter the date the check was received from the customer. If you wish, you may enter the date printed on the customer's check or the date of the postmark on the letter received from the customer. The date you enter here will be the date the program will use to determine whether any discount is still valid on each of the open items on the customer's account. If you specified above that the worksheet is to be printed for All customers, this Cash Receipt Date will be used for calculating the discounts for all customers. 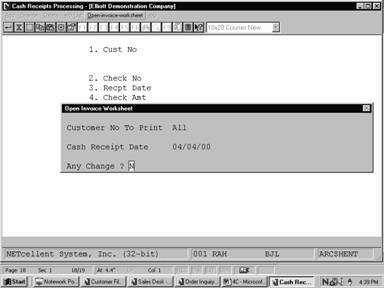 Post Cash Receipts transfers all transactions previously created in Cash Receipts Processing into the A/R Open Item File. 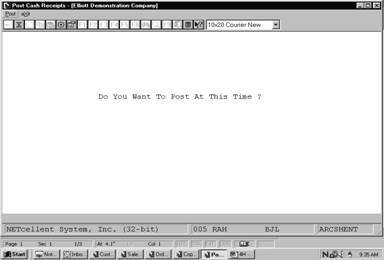 In addition it sends this information to the Customer File, Salesman File, and the A/R Distribution To G/L file. Consequently the result of posting serves to automatically adjust the balance that a given customer owes your business. When you perform a posting, the system prints a journal of all transactions that were posted. Enter Y to post or N to decline.